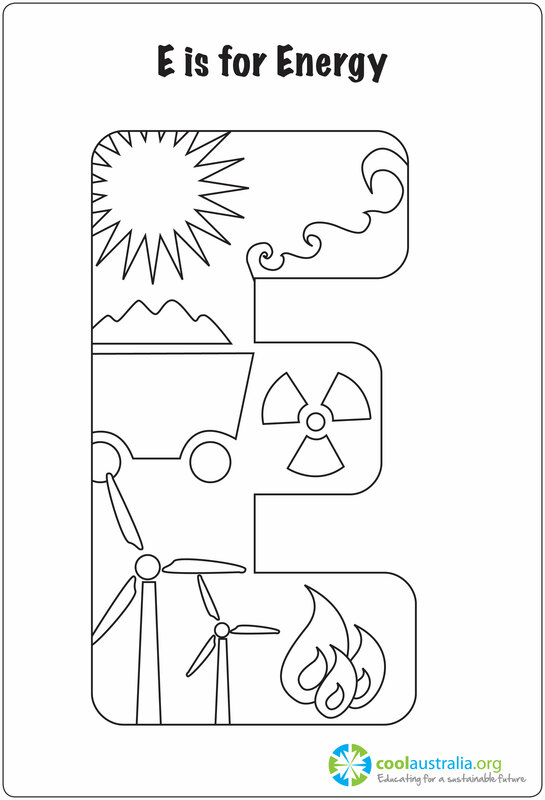 Quick summary: Introduces students to energy sources using the colouring-in sheet about energy and the letter ‘E’. There are different sources of energy. Learning areas addressed: English, The Arts (Visual Arts). Resources required: Art and writing materials, printed activity sheet. Keywords: Energy, art, colour in. Print out the 'E' for energy student worksheet. Find the letter E on the activity sheet. Practice writing energy and colour in the diagram. How does it relate to the energy? What are the colours might students use to colour it in? Find the letter E on the activity sheet. Colour in the picture and practice writing the word energy. The pictures on the activity sheet represent different sources of energy - the sun, coal, wind, water and fire. Can you identify the sources of energy on the picture? How do they relate to energy? What colours would you use to colour it in?